I love this!! It looks great in person and is really easy to do. The original pop art ladies have red dots on their face but as you can see I went ahead and changed my dots to white. I felt like the red dots make me look like I had chicken pox but this entire look is up to you. 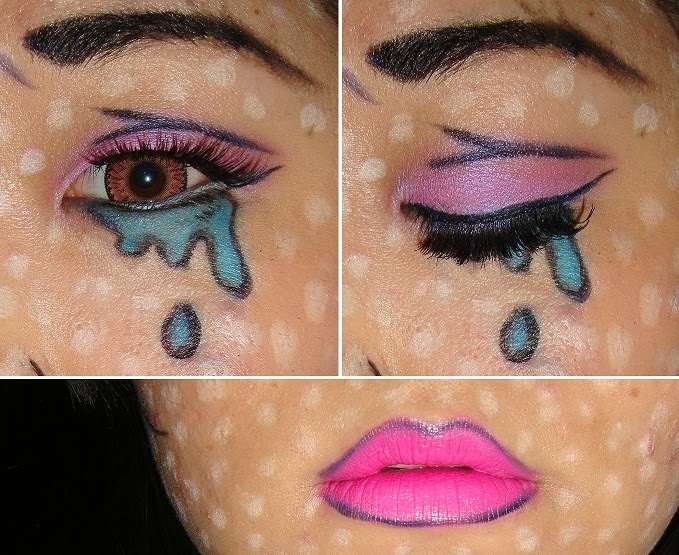 How you want your tears, the eyeshadow, lipstick, color of the dots and the black outlines.. everything is customizable. That is why I love this look so much. I have seen people do green, blue and yellow eyeshadow as well as yellow, purple, red, blue and pink lips and they all look great. What really ties the look together are the dots and the outlining of the face. Another great thing about the dots for this look is you can place them on some existing acne and/or scars and it will blend them into the look more. Doing this will help the look look more flawless. 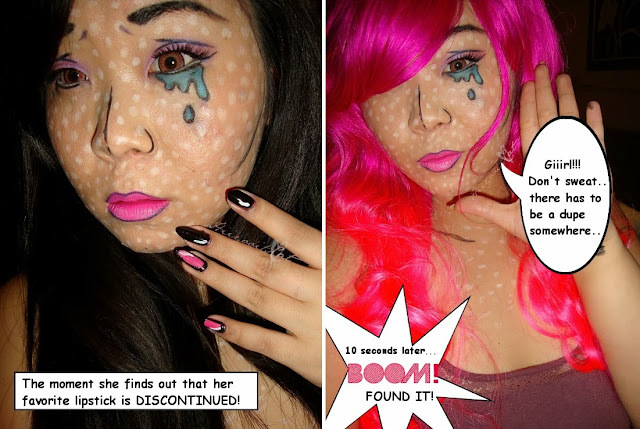 Just be sure to place the dots evenly so it looks more realistic. The wig is the Fuchsia and Pink Cambria two toned wavy wig. I hope you guys enjoyed this Halloween look! Hash-tag (#hiiyooitscat) me your looks on instagram and twitter so I can see you're version! Or you can simply just tag me (@hiiyooitscatb on Instagram and @hiiyooitscat on twitter). Stay tune for another look on Friday and next Wednesday. Wouldn't it be awesome if everyone starred in their own comic book! What do you think? Adventures of a Beauty Blogger! This is great! the Pop art look + nails so cool and pretty!